Cheap web design is a strange term, especially to anyone who actually works in the web design industry. As many web designers will tell you, there are a lot of individual people and businesses out there that seem to think that building a website is a simple task that anyone can do quickly. Regularly we see companies like 1and1 and even VistaPrint pushing out huge advertisting campaigns with attention grabbing sales slogans such as ‘Build your own website for only £19.99’, which seems fantastic. Why pay some highly skilled professional thousands of pounds when you can do it yourself for less than £20? The answer? Because cheap web design is extremely expensive. You’ve spent £1,000’s on your business, employed some great staff and spent even more money training them to a good standard, you’ve bought or hired premises to run your business from, paid for advertising and generally worked really hard to make your business successful, well regarded and (hopefully) profitable. So why then, after going to such lengths and expense to build something ‘good’ would you think you can suddenly skimp on your website by using a cheap web design service or company? 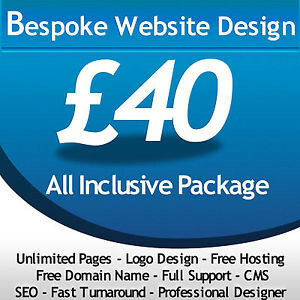 Your companies website is incredibly important, perhaps the most important marketing tool you have. Your site is often your customers first impression of you and your business, it more often will determine if the customer will actually want to buy your products or services. Some of the biggest and most successful companies in the world spend £1,000,000’s every year on ensuring that their website users get the best experience possible and before they’ve even contacted them they know their users have a good idea of the quality and brand just from visiting their website. If you’re looking for cheap web design services then think again, ask yourself “is this really all my business is worth?”. If you find yourself thinking “I’m not paying someone a load of money just to build a website, I’ll just do it myself” then please, think again. Web designers are highly skilled professionals and if you find a good company to work with then yes, it may cost a little more than you wanted to pay, but in the long run it’s a sound investment. Here at Performa Digital we don’t charge you the earth but we wouldn’t ever label our services as ‘cheap’ and would never use the phrase ‘cheap web design’ because you get what you pay for, it’s an investment that if done well will pay for itself the world over. So if you’re looking for a great looking website that gives your customers the best possible first impression and really provides the best value for money then why not contact us? It could be the best investment you’ve ever made!